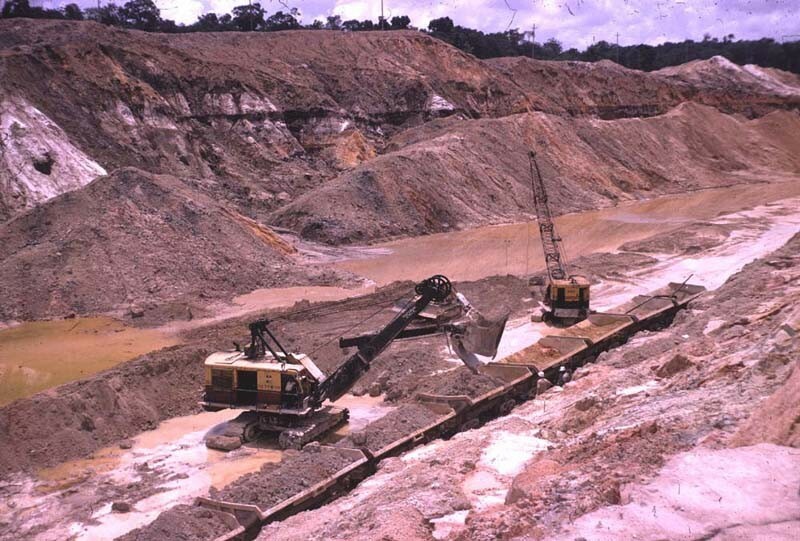 There were several bauxite mines developed by DEMBA in the area. Each mine had it’s own name. 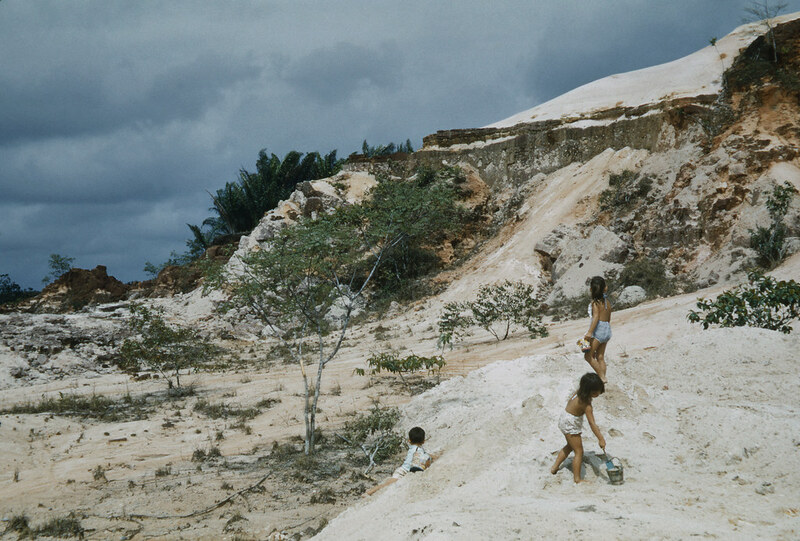 As children my father sometimes took us to play in one of the older mines called “Three Friends Mine“. Old mines are plenty good for somethings. Probably a big improvement over what was originally there. from Manly Binning Recollections Note: I am copying the original text here rather than just linking as I fear the link may disappear. Manly at the age of seventeen, attended Queens College School for boys in Georgetown. Graduated with a degree in Mechanical Engineering. His first job; Second Engineer to Mr. Dawson for Spronstons at Wismar. He then proceeded to work at the Steam Loco Motive at Demba, then to the Power House. Continued his career to the Machine Shop where he was made foreman and reported only to the Main Chief Engineer, where he spent many years. During his time at Demba Manly was a very adventurous man, always with a unique idea, he ,at one time converted “Big Bertha” an old Steam Engine to a Pile Driver and proudly named it “Lord Manly”. He always seem to have answers for problems concerning his field of work, and of course his household too. One of his favourite people was his boss Mr.J.G.Johnson who worked at Demba around the 1950’s. Mr. Johnson was a Canadian, and loved to fish like Manly, they went on numerous fishing trips “Up the River”, to Malalli and Canalli, but mostly to Rock Stone. Fishing was one of the better hobbies Manly had, along with the making of “Speed Boats;” the one that I recall is his first boat, “Flash,” unlike the looks of the modern speed boats today. It was long and slender in width, and slid through the smooth Demerara River. His next boat of my knowledge is Jet. His last boat, in which I had the pleasure of assisted him with the making was the “Vamp”. A much shorter boat than the first two. The last years of his career, Manly V.H.L.Binning was assigned to work with young men forwarding in the trade of Mechanical Engineering. During that period, he worked along with Mr. Eloctte, John Hammond, and John B.MacRae, all from England. Manly was liked very much by all of his colleagues, including the students. Even after retirement, he donated his time to help out with the exams at the Trade School. Manly continue to occupy his free time by going up the river to be among family and friends. Manly left this universe on February 9th. 1986, leaving an impression on the people who benefited from his gifts of caring. His last years were spent in close contact with his three grandaughters; Michelle, Franciene and Maria. “My trip to great falls and back.” By Manly himself. First Generation/ Tri-Clan Family of the Upper Demerara River. The land at Three Friends was posted “For Sale” in the Royal Gazette dated May 13th.1820. Sir John Spencer bought the land. He then espoused a wife by the name of Anna LaRose Simmons. 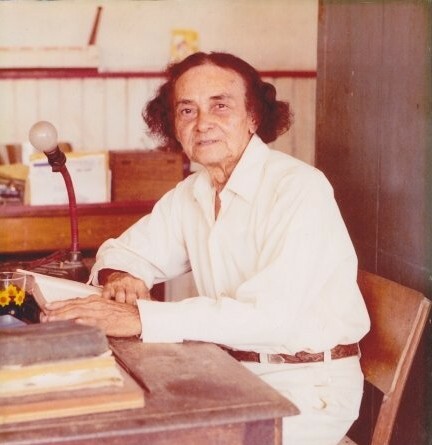 Anna LaRose Simmons was the sister of his friend the Amerindian “Chief Simmons” of Arrissabato, an Arawak settlement of the Demerara River. Sir John held Commission of Post Holder and Deputy Governor of Demerara. 1821: Sir John’s Great House was built at Three Friends. The Great House had moat and Cannons around it like a fort. The Union Jack flew at Staff Head during the day. From the house to the embankment on which stood the Cannons was a draw bridge. The Great House also carried two Grand Pianos and a Billiard Table, the table made of marble base. The rooms and Hall were richly adorned with exquisite carpets tapestry and curtains; a large and elegant chandelier hung in the large Hall. Sir John Spencer’s first son John was born in 1820. 1822: Sir John settledown to a life of luxury, entertaining distinguished people, mostly from England. They arrived in a Brig. 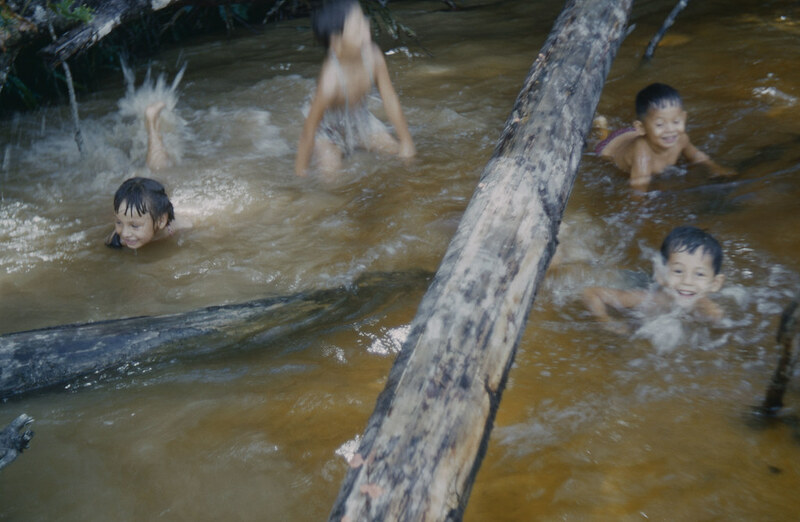 The Amerindians of the Upper Demerara River were his friends. He liked them, and they he. 1823: Sir John’s second son William was born. 1825: Sir John’s third son Charles was born. 1826: Sir John’s fourth son James was born. 1828: Sir John’s first and only daughter Mary-Elizabeth was born. In 1830, the early part of the year, Sir John Spencer sailed for England , taking with him his two older sons John and William with him to be educated. Seven years later, after Sir John died, John and William were returned to their mother through the Bank of England to their mother at Three Friends, bringing with them an abundance of household items, including silverware. All of Sir John”s children together with their mother were buried at Three Friends (Old England) in a particular spot identified by a clump of Palm Trees. Later the district became known as Akyma-an Amerindian word of surprised wonder as “Oh My”. John Spencer returned from England along with his brother William in 1837 and continued to live at Three Friends with their mother. His mother died in 1840.He married Nancy Allicock, daughter of R.F.Allicock of Noitgedacht. Nancy lived with her Aunt, (his mother) and shortly their issue of three children; Maria-Elizabeth; (named after the bauxite mine) Lucy, and John. Nancy died, and the children were placed under the care of his sister Mary-Elizabeth. John, cultured and courteous, but firm , and somewhat austere, and those who admired him the most were women. He became more reserved and quiet after the death of Nancy, cared only to travel up the river to be among the Amerindians who gave him the same respect his father received from them. Generally his vocation was Greenheart Timber cutting, being also the usual occupation of the Colonist. During the period of these travels and sojourns, the Amerindian Chiefess Kaiwailee bore him a daughter named Amelia. John took Amelia and had her sent to Basrkley’s Bank Manager household, there she was raised and sent to Urseline Convent for schooling. At the age of eighteen, she was returned to her mother Kaiwailee who had her settlement at a place called Wiribirisiri, Canalli; in the Upper Demerara River, which is of an Akawaian Tribe settlement. Shortly afterwards, Benjamin DeNieunenkirk, the only son of Richard DeNieunenkirk and Abigail Burton, married Amelia Spencer and had ten issues: Andrew; Gustavas; Richard; Benjamin; Wilhelmina, Jane; Abigail; Sarah; Madgie; and Eva.John’s three children by Nancy; Maria-Elizabeth, Lucy and John, also known as “Uncle Boisy” grew up under the care of John’s sister at Three Friends to eventually marry. With the marriage of George Binning to Abigail DeNieunenkirk, married the daughter of Wilhelmina and had an off spring of ten Binning children. John Spencer died at Canalli while uner the care of his daughter Amelia, was taken to “Three Friends” and was buried there. That’s my Dad’s story. How did you get the story. I’ve given it to some family member, not that it matter. I have another story that my Dad wrote on a trip to Great falls, if you would like that. It’s a bit lenghty; although quite enjoyable; and they stayed for a week. I think you would enjoy this. I am the second to last of the 10 Binning children. Married Herb Mitchell; later married Peterson from Canada. Living in San Diego County since 1970. I am qualified a True Californian. I knew Mr Binning. Grew up with George and his cousins Meg and Jennifer De Nieunekirk in Manni Street. Where are you people. Would be nice to get in touch. Best days of my early life. Tommy I am present in the San Diego County. Yes I remember those early years–my Dad had the Merry-go-round under the house which he invented himself, and do you remember the Race Horse game that he invented also? What a guy he was! I forgot the story was on the site The Manly Vivian Binnig website. My mistake. Many thanks to all the descendants of Sir John for posting his family history on line. I found it very interesting to say the least, and it helped with my understanding of the history of the place where I lived – and worked – from 1947 to 1967. (The Binnings, Allicocks and DeNenieunkirks (sp?) were names that everyone knew.) Interesting also to note that the bauxite mines were named after a few of Sir John’s descendants. Does anyone know where his “Great House” was exactly and what happened to it? I see a photo of a 19th Century waterwheel in Christianburg. Does anyone have the history of this? I read with great interest the piece on Sir John Spencer and Three Friends and would like to proffer some comments about it. I was stationed at the District Administration Office, Christianburg, between 1957-1960. My duties required me to travel up river, from Christianburg/Wismar/Mackenzie to Mallali, about 45 miles south, once monthly. I also travelled downriver from base to Santa Mission, Kamuni Creek, opposite what was then Atkinson Field, once monthly. On both trips, I would stop at villages, paying Old Age Pensions and Social Assistance, handling land matters, dealing with Amerindian matters, etc. I knew little about the history of Three Friends except that there was a place called Three Friends, next to Maria Elizabeth, some 10 miles south of Mackenzie. There was a mine there on the left bank of the river variously called Three Friends Mines or Maria Elizabeth Mines. There was also a steel bridge across the river. It was ostensibly a railroad crossing to ship ore from the mines to Mackenzie. I had the Government launch “The Rita C” stop there from time to time and went ashore. I never saw any Great House nor cannons. Strangely enough, there were cannons in the Upper Demerara River Administrative District. There were two cannons at the Mallali Church Mission which was also a school. There was one in front of the District Administration building at Christianburg. Next to it was a large, old-architectured building, almost twice the size of the Administration building and with servants’ quarters below, where the Sanitary Inspector lived. The size and style of the building suggests it was not built for a sanitary inspector but was used to house him in later times. Maybe at one time it was all one compound, with the Administration building being an administrative annex. It could be that the Deputy Governor for the Upper Demerara River lived there at one time, hence the cannon, the flagpole and the site as the Administration Centre. About 100 yards north of the Administration Building was what was then called “The Government Rest House.” Since there were no hotels around at the time, it was used to accommodate Government Officers on official visits to the area and to house the Magistrate’s Court. It was a huge two-storeyed building, with a bottom house, in an extensive compound, abutting the Demerara River. There was a pier adjacent to the compound which provided landing and boarding facilities for small boats and launches. It was the type and size of building that one could call a Great House. I lived in a room in it during my entire tenure at Christianburg. From what I was told by the Caretaker at that time, the building belonged to one Paterson. Maybe he was one of the two friends of Sir John Spencer. Paterson also set up a sawmill near the Rest House and the giant Water Wheel there was used to provide power for the sawmill. Paterson and his wife are buried in graves in the Rest House Compound. The graves were still there when I last visited the area in 2000. The Great House and the Canons were removed long before that. Paterson also had a moat and Canons at his house, when I was in Guyana, someone told me that they had just removed those Canons at Christianburg, and that was in 1998. I would just like to add that the top floor of the immense Government Rest House contained six large bedrooms, a huge kitchen and a huge dining/living room area. The bottom floor contained Quarters for the Caretaker and the Magistrate’s Court. In the large compound was a cottage in which lived the Cook/Assistant Caretaker. There was an iron fence around the graves of the Patersons. Unlike the three graves of British soldiers in the Cemetery at Section “C” Christianburg which were cleaned and whitewashed regularly, the Patersons graves were uncared for and therefore gray and cracked. I passed them daily to and from work but never took the time to approach them and read what was on their tombstones. Travelling monthly to Mallali to the south and Kamuni Creek to the north, there is absolutley no doubt that the Government Rest House, as it was then called, was the largest building in the Upper Demerara River District. Actually Maria Elizabeth Mines was named after John Spencer’s daughter Maria Elizabeth. LaRose Simmons espouse to Sir John Spencer and mother of John, William, Charles,James,Edward & Mary Elizabeth are buried at Three Friends. Wow, there is so much history here. Where do I start… I grew up in Manni St & Mora St in Mckenzie, and knew Meg and Jennifer De Nieunekirk and the Binning family from Arvida Rd. Georgie was the one I knew the best. Let ma know what became of him. And all of the names that are repeated so often in these posts.. they re-awaken so many memories of Mckenzie. I fondly remember my early formative days in that community, such a long time ago. Going to both Mckenzie Primary and Mckenzie High schools were wonderful experiences, and ones which have made me what I am today. I left (too early) in the 70’s, now live in New Jersey, and have only returned to Guyana twice in the last twenty-six years. It has changed greatly.. I guess the historic ‘boom and bust’ of mining towns also caught up with Mckenzie. Thank you for putting all of this together. This is part of our History, as we reserch of family and there life style let us come together and unite ourself and build our family tree together not for ourself but for our children and their children. At the turn into “Powell Cresent” where the Mackenzie Cinema was: There was a “Tennis Court” where people would go and play. I remember standing in our Gallery watching them for hours: and the “Ball Field” opposite the Market was at first the Sports Ground: whenever there was a Visit from the Royal Family, there used to be a Horse Show for entertainment. Correction of the Tribe at Kanaimapoo. Chief Simmons was an Akawain Tribe, not Arawak. The land at Three Friends was posted “For Sale” in the Royal Gazette dated May 13th. 1820. Sir John Spencer bought the land. He then espoused a wife by the name of Anna LaRose Simmons. Anna LaRose was the sister of his friend the Amerindian Chief Simmons of Kanaimapoo, Demerara River. Chief Simmons was of An Akawain Tribe. Sir John held Commission of Post Holder and Deputy Governor of Demerara. In 1821, Sir John’s Great House was built. The Great House had a moat and Cannons around it like a fort. The Union Jack flew at the Staff Head during the day. From the house to the embankment on which stood the Cannons was a draw bridge. The Great House alse carried two Grand Pianosand a Billiard Table, the table made of marble base. The rooms and Hall were richly adorned with exquisite carpet tapestry and curtains. A large and elegant chandelieur hung in the large Hall. Two tribes of Indians predominated the River—The Arawak, whose settlementwas at a place called Arrissatabo, and the Akawais, whose settlement was at a place called Kanaimapoo. can anyone elaborate a bit more about the John Blount and his relation to Charles ? “One Boviander family on the Demerara River lived at a lovely placed called Akyma, on a little Hill, rising about thirty feet from the river and crowned with feathery bamboos and tall cucurite and manicole palms. Their name was Bremner and their immediate ancestor was a Dutchman, who had been the post-holder at the Government post of Sebacabra, a hill on the right bank of the river about ninety miles from Georgetown.” Henry Kirke 1870. Very interesting reading Deanna. M.L.V. Binning was Machine Shop Foreman at DEMBA when my father John Forsythe worked there from 1929 to 1942. He wrote a recommendation for my father, of which I still have a copy. Both my parents are from the Spencer family tree, via James Spencer the fourth son of Sir John Spencer, of course I’m still working on confirming this fact. Do you know the spouse of James? This could do it for me. Very interesting, Uncle Manly was a genius and a great craftsman. Anyhow I would like to make one observation on his biography. Uncle Manly went to Queens College for two years and had to leave due to his fathers accident. He then started an apprenticeship with Sprostons in Georgetown, where he resided with his eldest sister Gladys, my Grandmother.. Furthermore Queens College was and is a High School and the do not give out degrees. I am researching the Van Sertima family tree. My spouse’s father (Joseph Piercy Van Sertima) is a son of Gladys Binning and Joseph A. Van Sertima. I would like to find out as many details as I can. If anyone is willing to provide any information they may have for the family, it would be greatly appreciated. Please contact me at dcmlbc@gmail.com (Donna). My spouse is Jonathan.